This is the second fully integrated DAC and amplifier I've reviewed in the last year or so. The first was the nuforce DDA100 which I rather liked. The unit under review is from a smaller manufacturer, based in Greece. This design takes the basic formula of an integrated amp/DAC and extends it, adding an SD card player to the mix, creating an all in one system to which one might only need to add a pair speakers. It's an ambitious item claiming to perform well above its price level and to offer "high end" sound at an economical price. That claim usually sets off alarm bells for me as it's an easy thing to claim but a difficult thing to do. An integrated system like this has several potential advantages. Short signal paths and no cables to buy or worry about. No system matching. But equally, most of those strengths can also be seen as weaknesses. No cables removes the possibility of tuning the audio by trying different cable geometries and materials. No system matching means that it's not possible to upgrade single parts of the signal chain. One incontrovertible advantage of this type of unit however is that the signal only undergoes one digital to analogue conversion in its reproduction. The unit receives the data stream from USB, coaxial or the built in SD Card player and converts it just the once to the output voltage at the speaker terminals. For digital amplification this approach makes a lot of sense. 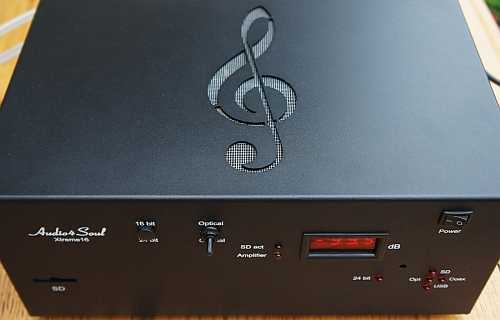 The Audio4Soul is a fairly simple black aluminium box. 35.5cm wide, 23cm wide and 16.5cm deep and weighing six kilos. So it's pretty chunky – functional rather than decorative. The size signals that this is a piece of hi-fi equipment not a desktop computer converter. Casing is simple black metal with slightly curved edges. The display is an old fashioned (now almost retro looking) red LCD and there are lamps to indicate input, 24bit processing and the status of the SD Card player. The front panel has an on/off switch and a selector to choose between the optical or coaxial SPDIF inputs. The top panel has a ventilation panel attractively cut in the shape of a treble clef with a grille beneath to stop dust entering. There's an on/off switch on the front to allow it to be powered down completely to save electricity when not in use. The unit under review is the XTreme16USB which is the more advanced of two options. As the name suggests, it has a USB input as well as two S/PDIF inputs (one each of coaxial and optical). The USB input can handle data rates up to 192Khz 24bit with the driver. Output is very conservatively rated at 16 watts. The cheaper basic model is the same but has no USB. The SD card player plays WAV, MP3 and OGG files up to 16bit/48Khz (note it will not recognise FLAC files). Both come supplied with a power cable, an 8Gb SD card and a dinky little USB card reader ready to load up your favourite tunes. Including the SD card and reader is a nice touch supporting the claim that the Audio4Soul has been built without "penny pinching". The Audio4Soul range is constructed by hand. It uses "audiophile" grade components (including REL and Nichicon capacitors) and claims to have the shortest signal path of any hi-fi system at just 10cm. The detail of the circuitry is confidential to the manufacturer and I was advised not to open the case and nose around as this would damage the componentry inside. This initially made me (as a somewhat paranoid individual) suspect that it might just contain a T-Amp and a cheap DAC. But – to jump ahead a bit - the listening tests bore out the claim that something very different is happening under the hood of this device and that it is a genuinely sophisticated unit. As a lower output amplifier, I put the Xtreme 16 into my second system initially, feeding the highly sensitive Acuhorn Giovane loudspeakers I had for review at the time. When those speakers went back to the manufacturer I put my normal Acoustic Energy AE509s (91dB) back in the room. The source was a Windows 7 PC running an Asus Xonar Essence soundcard. I connected that initially using an optical cable, later with USB. Pretty much everything about the system worked as it should. There were no hums, buzzes or clicks. As I changed speakers a couple of times I noticed the speaker terminals were really good quality. Switches are simple but effective. The remote control is a fairy large and not the most stylish design. But the buttons are big and, with one exception, it worked very well. That exception was a tendency for the input switching to skip between source selections too quickly making it difficult to settle on the preferred selection. The manufacturer was aware of this and managed to correct it during the review period, sending me a reprogrammed remote that worked just fine. It's good to have a decent and substantial remote control – I've commented before on the importance of the tactile relationship the user has with the remote. It's a relatively expensive item for the smaller manufacturer to have custom made so particularly welcome in this instance. The USB driver loaded easily and that input worked well. Curiously there was a very noticeable difference in output volume between different sources. SPDIF was the quietest, the USB input was louder and the SD card player louder still. This didn't cause any problems, it was just a little surprising and made it nigh on impossible objectively to compare the different sources from a quality perspective. The SD card player is a bit of an oddity. It offers a high quality, integrated source in keeping with Audio4Soul's ambition to keep everything integrated and signal paths short. But on the other hand the absence of FLAC capability and the simple LCD display really do restrict its usefulness. You can only move between tracks using the skip forward and back buttons on the remote so selection is entirely linear. Having said that, if you are prepared to go to the trouble of loading it with WAV files for a listening session or with MP3s for a party it will deliver music without needing a separate source. One disadvantage of the design is the lack of a headphone output. Nor is there a digital output which could enable daisy chaining to a separate headphone DAC/amplifier. In my second system this wasn't an issue – the Asus soundcard has a good quality headphone amplifier built in that I can switch to. But in the main system it would have been problematic as I sometimes like to use headphones for late night listening. The manufacturer asked me to try the unit in my main living room system, driving Usher Be-718 loudspeakers. Since they are fairly insensitive at 87dB/watt I normally describe them as the torture test for small amplifiers and had decided I wouldn't bother in this case. But since I was asked, in the spirit of understanding whether this was a combination he should discourage potential customers from using, I said I'd give it a go. My expectations were pretty low. But I was, frankly, astonished by the result. Bass was immediately impressive – deep and strong. The midrange was clear and open and the treble sweet. I played a range of material and it was consistently impressive. I started to wonder if I had misread the specifications so I pushed the volume up a bit higher. As I approached levels at the upper limit of what I'd imagine is bearable in a small room, the limitations did start to show. The sound became a little congested as it approached full volume - but until then sounded as good as virtually anything I've fed those speakers. I'd hesitate to recommend it for insensitive speakers because it would be very room and taste dependent but my experience was wholly positive at all realistic listening levels. I discussed it with the manufacturer who said he believed that the design of the power supply enables the system to drive relatively insensitive speakers better than the specification would indicate. So, back to the smaller room and easier speakers. More or less everything I played came across as open and natural sounding. There was plenty of detail although this wasn't at the cost of coherence or ease. Imaging was wide and deep with the sound extending behind and beyond the speakers. Bass was powerful although I think maybe the detail fell away a little in the lower parts of the range. Onto some specifics. My regular classical voice test is Anna Netrebko's delivery of "E Estrano!" from Verdi's La Traviata (on the compilation "Sempre Libra"). This is a high definition recording at 88KHz. The voice is recorded from a distance giving a real sense of the opera house acoustic. By contrast the strings are a little more present. The system delivered the vocal and the acoustic very clearly with good depth from the detail it rendered of the reverberation. The strings were good too although not up to the standards of the very best combinations in terms of inner detail. The woodwinds enter separately allowing them to be assessed alone. The system rendered them with a light and naturalistic touch. Moving onto large scale dynamic orchestral music the results were slightly less satisfactory although by no means bad. I listened to various extracts from the B&W Society of Sound 24bit recordings of the London Symphony Orchestra including the large scale Beethoven symphonies. These were clear and open, giving a good image but seemed to lack a bit in terms of dynamics and scale. It is a lot to ask of a system to render the Barbican Hall and the weight of a full orchestra into a small room so, to be honest I wasn't surprised at the result. Some other examples from my notes. Bob Marley's Jamming was attractively rendered – all of those little bits of percussion were clear and present. The system did well with saxophone. A high definition recording of Sonny Rollin's "St Thomas" was particularly striking. Snow Patrol – Chasing Cars – which can turn into a complete mush when the distorted guitars and synths enter – remained clear and punchy with good depth. The system seemed to thrive on higher bit rate material, bringing out the improvements this can render more than on some systems I've heard. As I write this I'm listening to the African crossover album, "Smoke, No Fire" by the fabulous guitarist Leni Stern. The rhythms are infectious and the rendering very natural. Harmony vocals are nicely separated. Percussion is crisp and the subtlety of the different guitar sounds very beautifully presented. I'm thinking I'm going to miss this unit when it goes back to the manufacturer tomorrow. The bottom line for me is that the XTreme16 offers very good value as far as sound quality is concerned. Much to my surprise it did bear out the manufacturer's claim that it punches above its weight. It's not hi-fi jewellery by any means but the money seems to have gone where it counts – into the sound. I was very impressed by its ability to drive more challenging speakers and deliver high quality, engaging, sound while doing so. Although only rated at 18 watts I think this will drive most conventional speakers to high listening levels in normal living spaces. It's certainly not a specialist piece for use just with high sensitivity speakers as I'd at first assumed. There are a few drawbacks. The lack of any facility for headphone listening will be an issue for some potential customers. Lack of FLAC file capability on the card player and the rather basic display could cause others to hesitate although I would think of the player as a bonus rather than as a regular source. But as far as the important basics are concerned – the ability to take a data stream and work with loudspeakers to play beautiful music - the Audio4Soul is very well judged and gets so many things right that it's well worth considering, especially at the price level.